As part of their program on high sweepback, the Hortens built the Ho.XIII to give flight test results on a leading edge sweep of 60 degrees. This increase of sweep reduced the aspect ratio to four. Control deflections were all doubled to compensate for the obliquity of the hinge line and the ends of the control flaps trimmed to run parallel to the new aircraft center line. The pilot had to be carried in an underslung nacelle to give him a reasonable view; the control column was inverted and hung from the roof of the nacelle. Undercarriage consisted of a main wheel inset in the nacelle and a fixed nosewheel mounted on a welded steel tube fork. Flying the H XIII totaled about 10 hours. Trials were interrupted in the middle by Scheidhauer landing in a barbed wire fence. CLmax was found to be 0.9, with the stick right back. 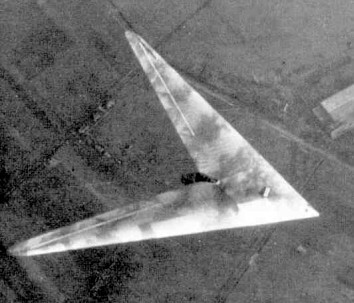 In this condition the incidence was larger than expected – about 20 – 25 degrees instead of 15 degrees, but Horten thought that the induced drag was not correspondingly increased. It was thought that the wing was not completely stalled with the stick hard back because the CG was too far forward. Control was moderately satisfactory, but in spite of the increased elevon travel was inclined to be sluggish. Elevator control particularly was much less sensitive than on other Horten aircraft.